On a summer day in 1674, in the small Dutch city of Delft, Antoni van Leeuwenhoek--a cloth salesman, local bureaucrat, and self-taught natural philosopher--gazed through a tiny lens set into a brass holder and discovered a never-before imagined world of microscopic life. At the same time, in a nearby attic, the painter Johannes Vermeer was using another optical device, a camera obscura, to experiment with light and create the most luminous pictures ever beheld. "See for yourself " was the clarion call of the 1600s. Scientists peered at nature through microscopes and telescopes, making the discoveries in astronomy, physics, chemistry, and anatomy that ignited the Scientific Revolution. Artists investigated nature with lenses, mirrors, and camera obscuras, creating extraordinarily detailed paintings of flowers and insects, and scenes filled with realistic effects of light, shadow, and color. By extending the reach of sight the new optical instruments prompted the realization that there is more than meets the eye. But they also raised questions about how we see and what it means to see. In answering these questions, scientists and artists in Delft changed how we perceive the world. In Eye of the Beholder, Laura J. Snyder transports us to the streets, inns, and guildhalls of seventeenth-century Holland, where artists and scientists gathered, and to their studios and laboratories, where they mixed paints and prepared canvases, ground and polished lenses, examined and dissected insects and other animals, and invented the modern notion of seeing. 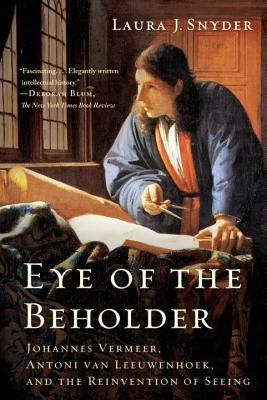 With charm and narrative flair Snyder brings Vermeer and Van Leeuwenhoek--and the men and women around them--vividly to life. The story of these two geniuses and the transformation they engendered shows us why we see the world--and our place within it--as we do today. Eye of the Beholder was named "A Best Art Book of the Year" by Christie's and "A Best Read of the Year" by New Scientist in 2015.